There is an elegant roll-top bath in a bathroom in Battersea that has clocked up more miles than many a family saloon. Rococo, an interior designer, spotted the well-travelled cast-iron tub in a reclamation yard in Norfolk. ‘You could hardly miss it – the sides had been painted a vibrant pink – but I knew it would be perfect for our new house,’ she says. The trouble was, the couple’s house purchase was still a few weeks off completion, so in the meantime husband Gavin resigned himself to driving the bath to and from his work, the tailgate sagging under the load. Happily the sale went through without a hitch and after a brief spell in Rococo’s brother’s garden, the bath on wheels made it onto terra firma, as the bathroom was the first room in the house to be given a new look. Rococo’s instincts were right and the roll-top looks the part in this smart, late-Victorian terraced home. ‘It’s the perfect illustration of my philosophy that if you find something you love, you should go with it, and worry about the detail later – there’s always a way to make it work, even if at times it might seem a bit unconventional,’ she says. Gavin and Rococo were sold on the house from their first viewing. ‘It was in an area we loved; in fact, we were living just up the road and we could see that it had lots of potential, even though the layout wasn’t terribly practical,’ says Rococo. With that in mind, after the bathroom, Rococo turned her attention to the main living space. With a deep bay window, original fireplace and high ceilings typical of Victorian townhouses, the reception room at the front of the house had the key ingredients for a stylish period look. Behind it and a step down was a small, dark dining room. ‘The main living areas seemed to be full of unexpected changes of level, and dark pockets of unused space,’ explains Rococo, ‘so we tackled them one at a time, to create a brighter, more spacious feel. It didn’t take much, but our small alterations have made a huge difference. it too made an unorthodox entrance to the house – through the bay window, with the help of Rococo’s brother Henry. ‘He was an absolute hero. He took out the windows to get the sofa in for us, and it is here to stay now,’ says Rococo. She’s equally happy sourcing antiques and decorative items for her interior design clients as she is for her own home – although for clients she works to a mood board, picking furnishings to order. ‘There was no mood board here, it was much more fluid; the house just evolved naturally and continues to do so,’ she adds. So what of the last big project? ‘Well, actually it wasn’t so big,’ says Rococo. ‘We just added around two metres to the kitchen and reconfigured the space to make it work better for us.’ The previous owners had completed a side-return extension to the kitchen, but the only way into the room was through the old dining room and down a couple of steps. Rococo had a cupboard removed to allow for a new door to the kitchen from the hall, and the result is a much more useable space. 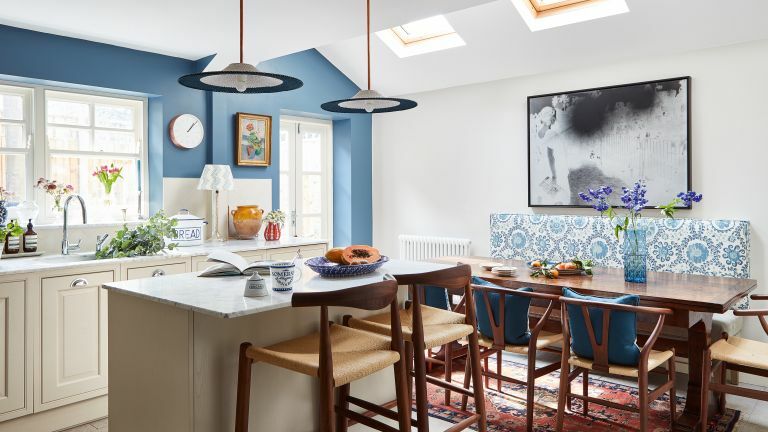 Furnished with a stylish blend of elegant antiques and clever contemporary buys, the kitchen is like the rest of the house in essence – a bright, practical, comfortable place to spend time.